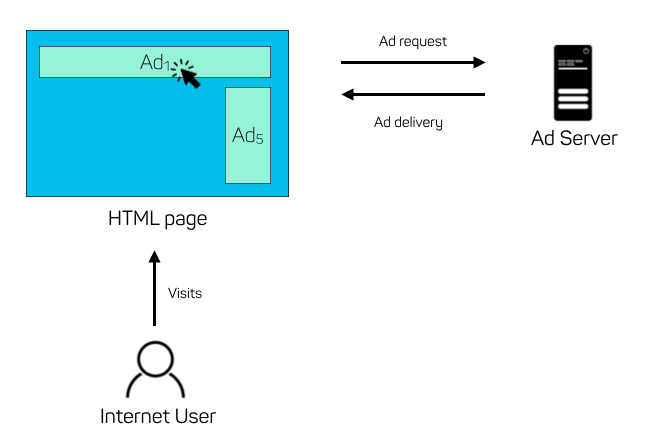 This blog post describes how matrix factorization can be applied to the problem of ad targeting. 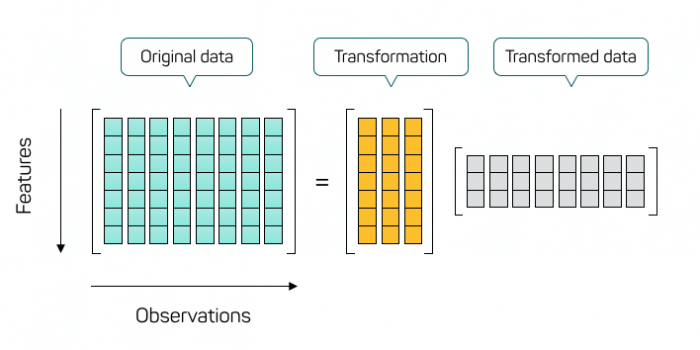 It draws from my experience of developing a machine-learning-based solution for this task for the real-time performance marketing company twiago together with other colleagues from our Data Science team. This all should happen in a blink of a moment and finally the page renders to the users containing two ads. Now the next interesting thing that could happen: the user clicks on one of the ads. If so, the advertiser will pay a certain amount of money to the operators of the ad server and the page owner. There is a whole industry for this and in general a huge market for online advertising. There is a mutual benefit here: Advertisers can publish on various sites, potentially reaching different audiences, while publishers will benefit from “crowd wisdom” (or: collaborative filtering) as ads are exposed to more users and will finally flock to the right ad spaces. In this formula you should think of the denominator as the number of “unique views by unique users”. The click-through rate depends on the ad space and the ad. The number of clicks and impression counts are with respect to a fixed time window (one week in our case). Side note: What technically counts as an impression can be defined by certain industry standards (e.g. 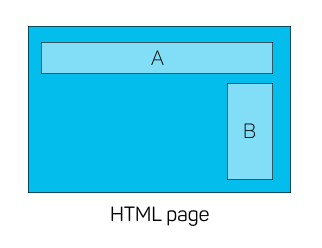 those provided by www.iab.com) and is part of the implementation of the ad serving technology. 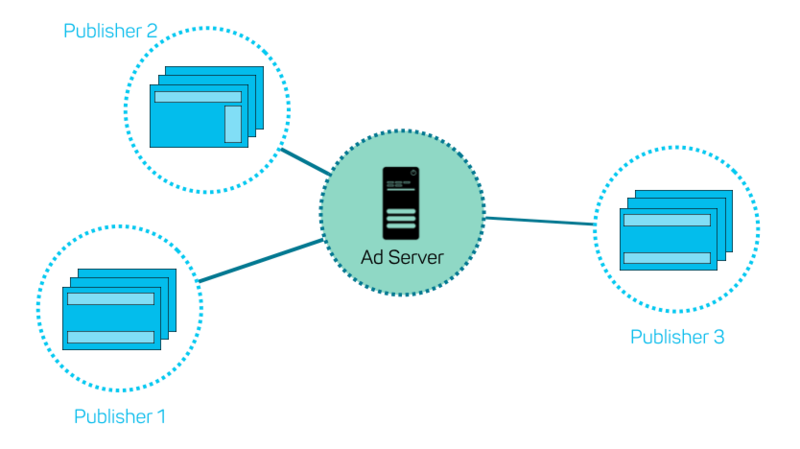 We can ignore the technical details and trust the ad server to provide a systematic way of counting “impressions” and providing this information to us. We can rephrase the problem stated above as in the following terms: we have to fill in missing values of the click-through rate matrix and rank ads by the thus predicted click-through rates. Of course, the predictions should somehow align with the already known values. 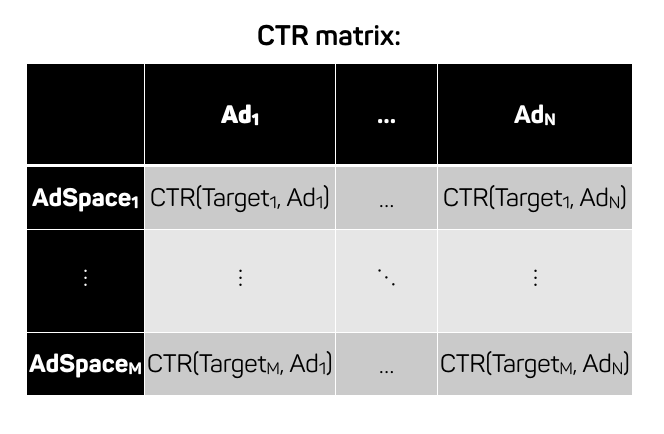 Assuming that we have M ad space in our complete network of publishers and N ads we could deliver, we can write down a matrix of shape (M x N) that records for each possible combination (Ad, AdSpace) the currently observed click-through rate. This matrix is called click-through matrix (for short: CTR matrix). Of course, this matrix would contain missing values for the following reason: not every ad has been (and likely never will be) shown on all possible ad spaces. So certain combinations have not occurred yet. As said, we would like to fill in these values with the constraint that we do not want to deviate too much from the known values with our predictions. Side note: Typically this matrix would be rather sparse. But thanks to the fact that we target ad spaces (rather than individual users) on websites with a lot of traffic, impressions and click counts for individual users aggregate rather quickly to yield a matrix with a good degree of filling in the course of a week which was the time frame for our batch job. 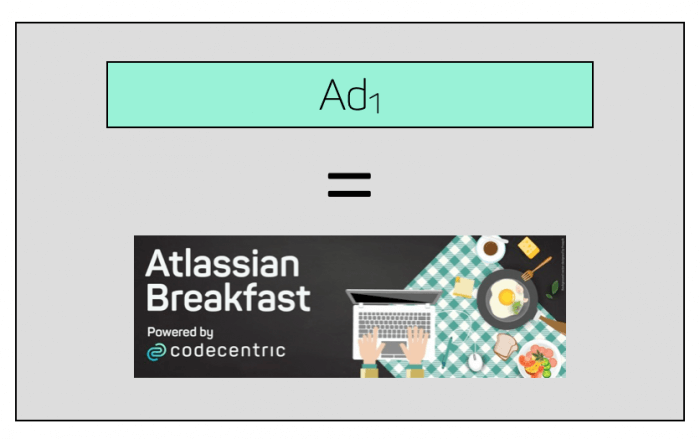 We are interested in predicting these missing values since they might reveal how well a yet unknown combination of ad and ad space would perform and whether it would make sense to bring them together. How can we achieve this? A popular technique for such collaborative filtering tasks is matrix factorization, which is what we also use here. This says that the j-th column of the product X is given by weighting the columns of W with the corresponding weights from the j-th row of H and summing everything up. Now for a given matrix X there might be several ways to decompose X as product WH. A point of interest is to choose the pair (W, H) such that the number of rows of H (equivalently: the number of columns of W) is strictly lower than the number of rows of the original matrix X. This would mean that we reduce the number of features in our representation and correspond to data compression. The idea is that during the compression we will learn what information present in X is important and which is not. 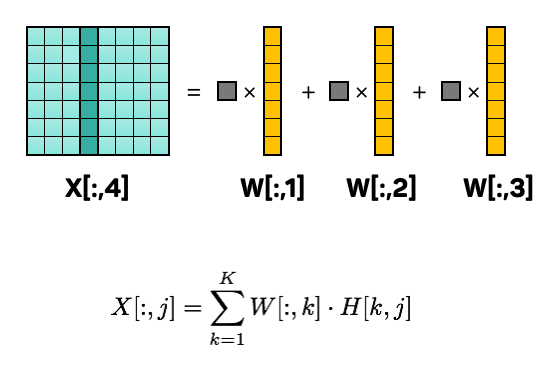 But how would we learn this compressed representation? We attempt to approximate X as WH (denoted as X with a hat in the picture). 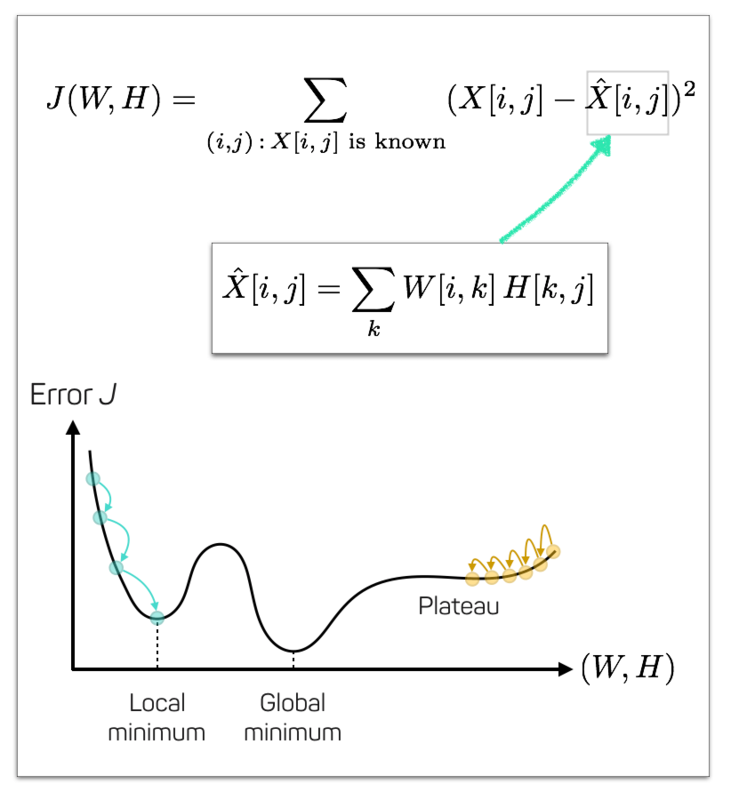 For this, we try to minimize the error J(W,H). This error is given by comparing the squared errors between the known entries of X and the approximation WH. (Remember our click-through matrix has missing values; so this fits into the overall picture.) 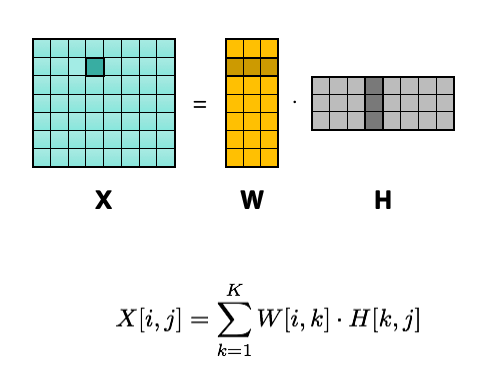 One can use the Alternating squares algorithm (ALS) to compute such an approximation. We delivered a software solution that runs a weekly batch job in the cloud. 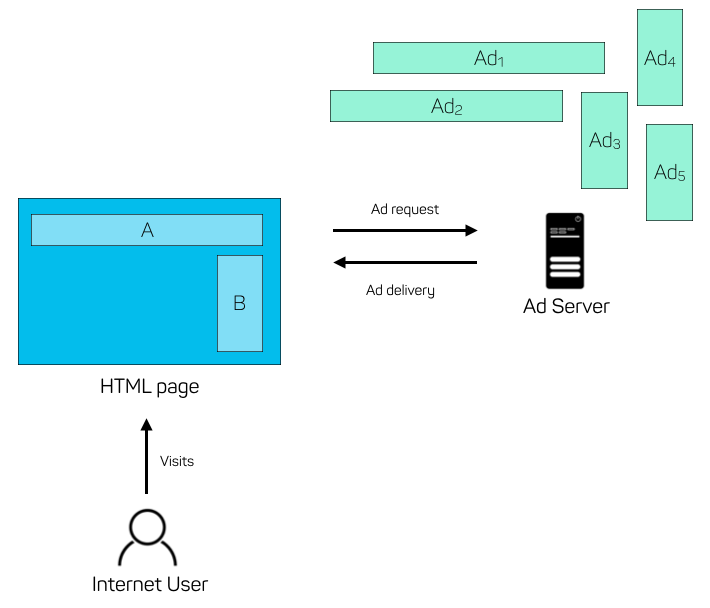 It first fetches the impression and click statistics from the existing ad server and then computes a table of favorable ad and as space combinations for the next week. For this, it used the mathematical optimization we outlined above. The final solution is deployable to Amazon Web Serives (AWS) as JAR. In this concrete case we use a single EC2 instance to run the weekly batch job. In a live test we observed a performance improvement of 15 – 20 % compared to the existing system based on expert rules. This is quite good and shows the potential of using a machine-learning-based approach in this case. In this blog post we explained how matrix factorization can be used to predict missing values from a data matrix and saw how to apply this technique to the problem of ad targeting. 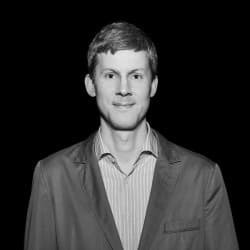 Daniel Pape has a PhD in mathematics and worked as Senior Data Scientist/Engineer at codecentric where he leveraged his knowledge as part of the Data Science team to develop data-driven applications.